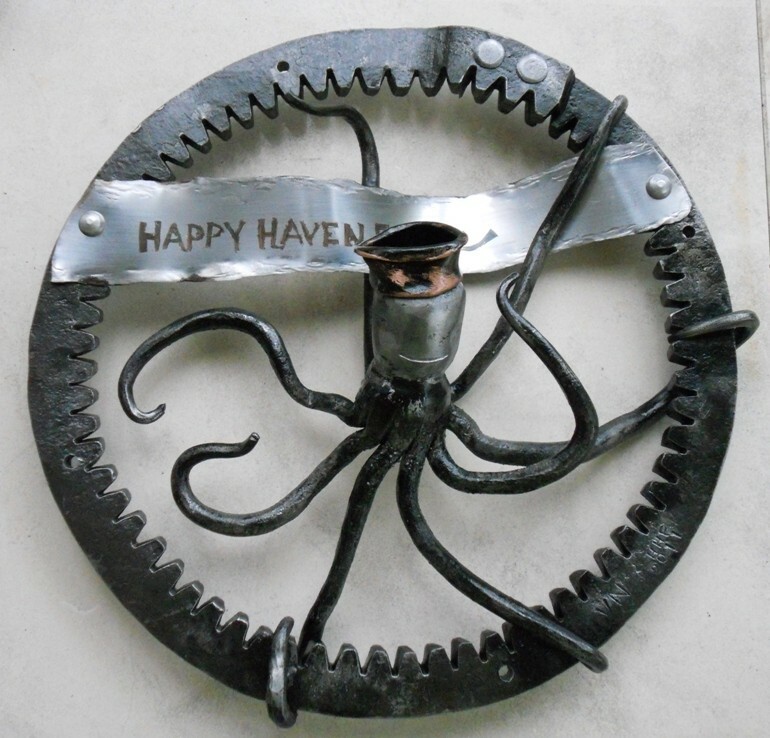 Happy Haven Forge | Blacksmithing: "Making exquisitely simple items extraordinary and tremendously complex items understatedly simple"
Hi everyone, I have been gone a long time. This past month I had a flurry of activity making a lily in a vase, a Crucifix and I am partially done with a sculpture of two dancers. Both the Crucifix and sculpture are in keeping with more modern lines, more figurative rather than literal interpretations. It was good to be out there using the hammer. As you can see the drawing of the dancers looks more like boxers. Hahaha. My dog Mimi came in for a visit. She has a broken leg and was all happy to be outside. We have to keep her corralled for at least 8 weeks to make sure it is healing well. Photos left to right: Female dancer parts, crucifix full face, Lily in a vase, reverse twist of headboard, next two body of Christ being formed, side profile of crucifix, Dancer sketch and my girlie dog Mimi. Okay folks there you have it. 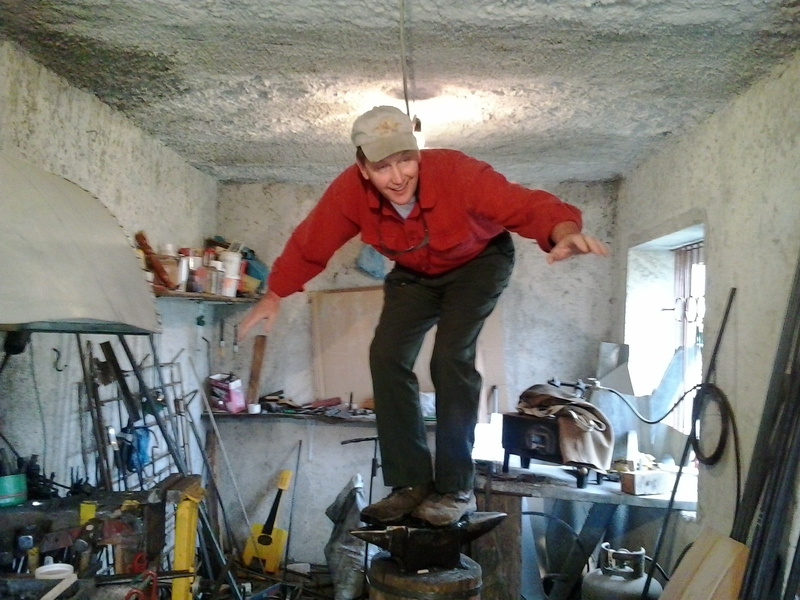 I am still blacksmithing, just took a hiatus for a few(?) months. Hope to be back making more stuff. I will post when I complete the dancers and a headboard I am making. Latest project is a garden/privacy gate leading to the backyard. It will replace an old gate made in haste to keep the marauders at bay before this part of the property was reclaimed from the communists and fenced off this July. The gate is made from left over materials from the fence and a temporary sheet metal wall. To speed the hammered look I made a special tool, :). I thought I would be able to weld each individual section onto the frame, but that didn’t work out so I used welded strips to hold them in place. The hammering made the sheet metal fairly stiff. I also thought I would have enough ventilation in my back section of my shop, but with the zinc coating I decided not to chance the exposure and set up in the forge side. Very tight for this size project. I will move both doors back to the larger back section to weld the frame, hinges and slide bolt in place. I will add a few more pics when I finish the entire project. Being a Blacksmith is fortunate, why, because we always have something to be thankful for. Not hitting our fingers, burning ourselves, the ability to make a new tool and better yet to occasionally sell one! So raise your glass and give a toast to the blessings that have been bestowed. Remember to think about all those others who have to go to the store just to get a chisel!